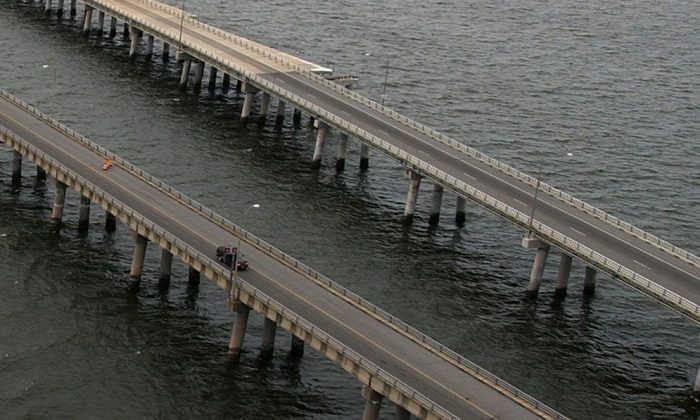 The body of the driver of a tractor trailer that crashed on Chesapeake Bay Bridge-Tunnel and plunged into the water has been recovered, two days after the accident occurred on July 27. Thirty-two-year-old, Jervone Rakeem Hall’s body was located on the morning of July 29 and recovered by 1 p.m that day. The body of the passenger of the vehicle, 29-year-old Christopher Fenner was recovered by the evening of July 28, Delmarva Now reported. Officials used EZ-Pass statements and witness testimony to find out the identity of the driver, according to Tom Anderson, deputy director of finance and operation for the bridge-tunnel, The Virginian-Pilot reported. The truck fell 20 to 25 feet into the water, and wasn’t recovered until 2 p.m. on July 28, after the tide went out. Officials are using the truck’s black box and cellphone data to investigate what happened. The tractor trailer was involved in a crash with a van before going into the water. No one in the van was seriously hurt. At the time of the accident, authorities dropped the speed limit from 55 mph down to 35 miles mph due to pending storms. When winds rise, officials lower the speed limit, and under certain conditions restrict large trucks that aren’t carrying enough heavy cargo to remain stable across the bridge-tunnel, The Virginian-Pilot reported. In an ABC 13 report, truck drivers and locals expressed concern that the guardrail across the bridge is too low, representing a danger to those driving across the bridge-tunnel. The guardrail and curb were both severely damaged in this latest accident, Delmarva Now reported. In February 2017, winds blew a tractor trailer off the Chesapeake Bay Bridge-Tunnel. The 47-year-old driver died on the way to the hospital.